Can you imagine a day when Anthony Bourdain and Paula Deen will peacefully break bread together? He can — but only if it’s in secret. Anthony Bourdain and Paula Deen are poised to go from feuding enemies to dining companions. The pair, who’ve publicly trashed each other’s cooking skills and business moves, may be about to turn over a new leaf. Though the comment remains a light jab at Deen’s diabetes announcement and simultaneous product promotion, it’s a far cry from the heated words these two have exchanged in the past. Even more amazing, the No Reservations host would consider sharing a meal with his rival — but only under hush-hush circumstances. 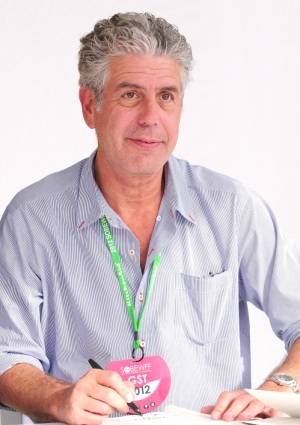 Do you expect we’ll continue to see Anthony Bourdain’s softer side going forward?